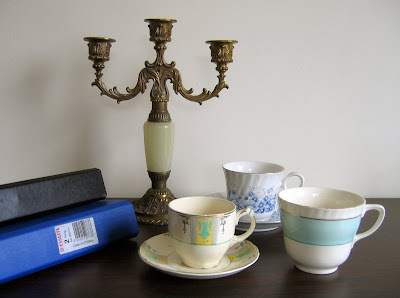 I went on an Op-shop mission yesterday to find some more teacups for a wholesale order. Here is a pic of some of my new goodies. I found some great shops on my travels. I went to Woolston first – a great desitination for any avid op-shopper or retro fan! I found a vintage candlebra in a secondhand shop a couple of doors down from the Salvation Army Family store. It will be great to use on my stall to display candles – the other one I've used was hired. On my way back to the car, I noticed a bike shop that specialises in buying, selling and restoring classic/retro bikes and parts. I mentioned a rather large stash of bicycles in this post that needed a new home, and I just might have found it! The shop is at 618 Ferry Road, worth checking out if you're in the market for a retro bike, or some parts. I bought a couple of old ring binders from the Super Shed to re-cover with some handmade paper I bought from the Drawing Room earlier in the week. I've noticed they are never in short supply at op-shops, and decided earlier in the year to buy them second-hand from now on. The paper wasn't quite as large as I'd hoped, it was the exact width of the folder. I had to tape along the edges instead of folding them over, but I'm still quite pleased with how they turned out. I might even file away my receipts more often now! I have been slowly working away on my business plan, and have finished the marketing section. I worked through the Business Growth Planner from Crafting an MBA which I can recommend. It's designed for crafters, and helps you to turn your goals into a plan you can follow to help them become a reality. To get some numbers to work with, I figured out the minimum income I require to pay for living expenses etc, and added on an approximate weekly amount to cover overheads. This got me my starting figure. Then I took the amount I'd like to be earning in a years time, added on the same overhead amount to get my target for the next year. A simple way to get incremental targets that bridge the gap between the two is to subtract the first number from the second, divide it by twelve, and increase you monthly target by this amount each month. I hope that makes sense! So now I have some numbers, I just need to try and hit them. I'll keep you posted every now and then with how that goes, and what I did to get there. My first step is to start improving the copy in my listings on Felt. I have taken some advice from this post from the Craft Venture Series on the Paper n Stich blog. I have started with the listings for my soy tin candles, and will work through them all over the next few weeks. I'm hoping this will increase my conversion rate from views to sales. 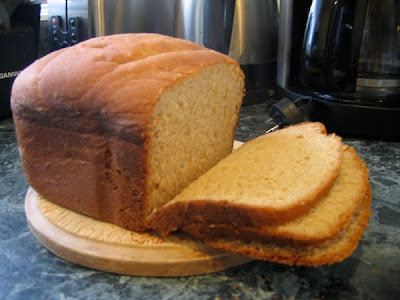 I have also been working on refining my budget friendly breadmaker recipe for tasty gluten free bread. It might sound like an impossible feat, but today's version is tasting very good. I think I might be almost there with perfecting it. I'll post up the recipe when I've got it just right. Best of luck with your breadmaking. I wish I had know you were going op shopping in my neck of the woods, I would have volunteered to come with you!! Hiya Rose - you have been busy! Your candles will look fab in your new(old) candelabra. And that bread looks decidedly yummy - I look forward to the recipe :) . Speaking of which you might like my gluten-free brownie recipe - I'm going to post it soon as I get asked for the recipe a lot!! Retrofemme – Thanks, I'm glad you enjoyed reading it. Deb – It was a spur of the moment trip, I went to make the candles and realised my teacup selection wasn't up to scratch. I'll be sure to let you know next time, especially if you know of any good spots for teacups! Mel – I look forward to the brownie recipe. The bread is still really good today, and I think that's the true test of bread quality! I'm going to try it again with just one egg, if that doesn't work this current recipe is the winner.